• Third-quarter revenue was $16.1 billion. Excluding McAfee, revenue was up 6 percent year-over-year and datacentric* businesses grew 15 percent year-over-year. The data center, Internet of Things and memory businesses all achieved record revenue. • Record operating income and record earnings per share (EPS), driven by strong data-centric growth, expanding operating margins and gains on the sale of equity investments. • Raised full-year business outlook for the third consecutive quarter. Full-year revenue outlook raised by $700 million to $62 billion; full-year GAAP EPS outlook raised by $0.27 to $2.93 and non-GAAP EPS by $0.25 to $3.25. Intel signed long-term NAND supply agreements worth $2B and received $1B (of that) in Q3. 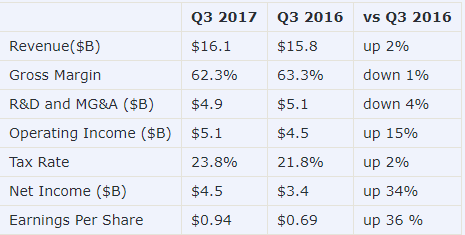 Intel's data center, IoT, FPGA and memory groups (all growing nicely and steadily) now make up 45% of Intel's revenue, up from 30% in 2012. Intel achieved record Core i5+7 shipments. Low volume 10nm product ships EOY and high-volume availability in H2'18. Mobileye M&A closed 4 months earlier than expected. Not mentioned in earnings call: 3D XPoint, Intel Custom Foundry business, Xeon Phi, Cascade Lake. Another quarter, another record. Yawn. Intel quarterly reports will get very interesting in 2018 and going forward. 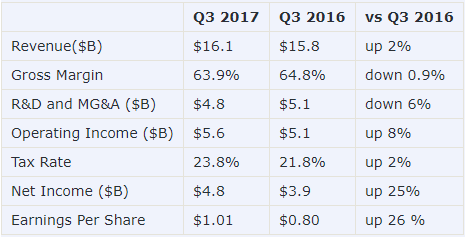 Basically Intel is making more money because they laid off a bunch of people to cut costs while jacking up prices on the notebook processors. They aren't going to be able to do that anymore with Raven Ridge being reasonably competitive. Figure they will have to cut prices big time on DCG too eventually. i wouldnt be surprised if they started giving oems more money.